Though still a relatively young scholar (nine years since receiving his Ph.D.), Steve Barnes can rightfully be considered the dean of Gulag studies in the United States. From his provocative 2003 dissertation, to his Gulag: Many Days Many Lives website, from his many public talks to his mentoring of other scholars, Steve has been at the forefront of all things Gulag over the past dozen years. He organized a conference devoted to new interpretations of the Gulag, he helped facilitate a traveling Gulag exhibition put on by the National Parks Service and Gulag Museum in Perm, he has authored several scholarly articles, and his current slate of projects includes several devoted to Gulag themes. I therefore consider it a privilege to review his latest and most important work, which is in my mind the most significant book on the Gulag since Aleksandr Solzhenitsyn’s Gulag Archipelago. On the surface, it has much to recommend it against other works on the Soviet penal system. It covers the entire Stalin era, plus a little beyond. It is a detailed study of one location—Karlag—but it employs evidence from across the Gulag. It is based evenly on archival and memoir sources, both of which are necessary to understand the Gulag phenomenon. It covers a range of penal institutions. And it explores both the theory and the practice of punishment in the Soviet Union. The primary contribution of Death and Redemption is the author’s willingness to ask (and, of course, answer) a seemingly simple question: Why did the Soviet authorities spend enormous amounts of energy and resources “to replicate the Soviet social and cultural system within the Gulag?” In other words, why not just kill the prisoners either through execution or through penal labor and use the resources on any number of other important priorities, rapid industrialization being chief among them. Why go to such lengths to try to reform them into good Soviet citizens? Certainly, millions of Soviet subjects were shot or worked to death in the camps of the Gulag, or left to die in the so-called special settlements. But several times more survived confinement and returned to Soviet society having supposedly undergone the process of “reforging” or “re-education.” To some this re-education process was a farce, lip service to Bolshevik identity that prisoners simply ignored or manipulated to their own advantage. Barnes, while not dismissing such reactions to the re-education process, nonetheless accepts it as real, as tangible evidence that the Gulag represented not just the fears of Soviet socialism but its hopes and dreams as well. Indeed, he views it as a crucial link for understanding in their full complexity the tensions inherent in the Soviet worldview, and, more narrowly, in their vision of criminal justice in a socialist society. This understanding of the Gulag as a microcosm of Soviet society, with events, institutions, and relationships in the Gulag mirroring those outside the barbed wire, owes much to Solzhenitsyn, as Barnes readily acknowledges. Yet Barnes views this not as an exclusively negative, repressive phenomenon as Solzhenitsyn does, but as a positive, constructive one. It was perhaps not a moral system, but it operated within its own system of ethics that made sense to its practitioners. From political indoctrination sessions to socialist slogans in the barracks, from literacy classes to musical performances, Gulag life was organized around this new socialist ethos. And the most important part of this ethos and of Gulag life was labor. It was the primary method and indicator of re-education, of the inmate’s readiness to return to a productive life outside the barbed wire. Those who failed this critical test could have no place in Soviet society—they were slated for death. 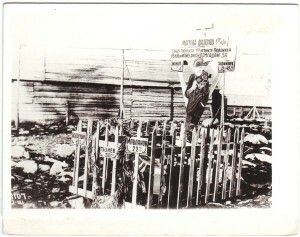 Here a mock grave complete with coffin has been constructed for members of a prisoner labor brigade. The crime, as depicted by several signs, each bearing a prisoner’s surname along with a percent—22%, 30%, 42%—was underperformance of the work quota. Laziness. The message is unmistakable: those who do not perform their labor duty are not submitting to re-education. They will exit the Gulag not by release but by death. Or as Barnes puts it: “In the harsh conditions of the Gulag, the social body’s filth would either be purified (and returned to the body politic) or cast out (through death).” (14) What is important here is that both options—death and redemption—are appealing outcomes in the Soviet worldview. Setting deadly violence alongside correction was not a contradiction, but an ideal. It was not a perversion of socialism, it was not some sort of Stalinist deviation, it was how socialism was to be built. This argument is the central tenet of the book and a significant departure from most other works on the Gulag, from Solzhenitsyn’s and Anne Applebaum’s memoir-based studies, to the more archivally-grounded works of Oleg Khlevniuk and Galina Ivanova. It is also an important theoretical foundation on which younger scholars, including myself, can build. Yet when it comes to practice, things were not so neat, and it seems to me that Barnes takes the death-or-redemption dichotomy too far by tightly linking survival with re-education. There were more exit options to prisoners in the Gulag than re-education and release or resistance and death. It was certainly possible to accept and submit to re-education, to perform acceptable or even herculean feats of labor, and yet still perish in the camps from malnutrition, a worksite accident, disease, or at the hands of violent guards or fellow prisoners. Perhaps such cases can be explained as the innocent chips that flew as the proverbial wood was chopped. But it was likewise possible to resist or be completely indifferent to re-education and yet still be released. Indeed, the primary form of release under Stalin, as Barnes acknowledges, was simply the expiration of sentence. Penal reformers globally had long discussed the idea of indeterminate sentencing, of holding convicted criminals until they were deemed worthy of release into society. Yet the Soviets shied away from this practice, preferring a fixed sentence that in certain times and places under Stalin could be reduced by good-time (workday) credits, parole, or pardon, but in other times and places could not. In other words, without any sort of final assessment as to their correction while incarcerated (other than a pulse? ), the Stalinist regime was letting convicted criminals back onto the street. Neither death nor redemption, one might argue. And in the post-Stalin era, when criminologists and penal officials began to track recidivism rates, they quickly realized that this is precisely what was occurring. Indeed, given Barnes’s dichotomy and what we know about productivity and the wide range of attitudes of prisoners in the camps, perhaps we should ask why more deaths did not occur in the Gulag. Why were the special camps created, where inmates were subjected after the expiration of their sentence to exile? Why not just kill them if they were so irredeemable? What restrained Soviet officials in the regular corrective-labor camps from being more brutal toward underperforming prisoners, particularly in the last five years of Stalin’s life, when the (official) mortality rate in the Gulag slipped to roughly 1 percent? Were 99 percent of Gulag prisoners demonstrating their redemption, or at least their redeemability? Were the 1 percent who died the ones who resisted re-education? And, on a related note, how well does this narrative of death or redemption map onto all the other features of life in the camps as described by memoirs and official documentation alike: endless corruption, tufta (cooking the books), gang warfare, everyday violence perpetrated by guards and prisoners alike, and so forth? My sense is that while Barnes is correct to point out that Soviet ideology and the particularities of the Soviet state created in some minds a death-or-redemption ideal for the Gulag (at least in the 1930s—the 1940s and 1950s seem to me more complex), Gulag life can only partially be explained by this dichotomy. This is not to say that Barnes’s portrayal of the realities of camp life is simplistic in order to prove his point. On the contrary, the problem is that what Barnes describes in the camps often does not reflect his central argument of the Gulag as a last chance for redemption with the other option being death. Just a few additional words of praise to conclude. Barnes’s description of how camp life was organized and categorized both detailed and nuanced, reflecting the complex realities that faced both prisoners and administrators in the Gulag system. Barnes is correct to point out that both economics and corrections mattered in the Gulag. While many memoirists and scholars have focused on the economic side of the camps, Barnes masterfully details a whole host of correctional and penal practices, including labor, that both complemented and collided with economic aims. His discussion of how inmates were categorized by administrators and prisoners alike sheds valuable insight into how Gulag society functioned. His detailed description of the special camps and their divergence from the regular corrective-labor camp system is a particularly important contribution of the book. His exploration into the camp revolts of the immediate post-Stalin era is masterful. In short, I cannot say enough about Death and Redemption—it will remain an important contribution to our understanding of the Gulag and of the Soviet phenomenon in general for decades to come. We will soon see if those enrolled in my senior research seminar devoted to prisons and concentrations camps agree—it is one of four works that made the mandatory reading list. Congratulations, Steve, on an excellent book. This entry was posted in Death and Redemption, Gulag, Soviet Era 1917-1991, Stalinism. Bookmark the permalink. First: not all categorizations were based primarily on type of sentence or on, say, one’s biography or background. The various ration regimes in the camps, for example, were technically based on the type of labor the prisoner performed, and the prisoner’s ability to fulfill work norms. This may be tied to redemption, but on the other hand a close reading of the ration regimes reveals an emphasis on economic imperatives. Certain camps (for example Norilsk and Vorkuta) were even on a different, enhanced ration system due to their economic importance. Moreover, these specific regulations do not reveal differences related to sentencing or background. Those fulfilling their norms at 100% were supposed to get the basic ration, regardless of sentence. And Second: Along these lines, moreover, it’s difficult to imagine that some of these categorizations worked in practice the same way that they worked on paper. To take rations, once again: are those doling out the rations really measuring on the basis of the twelve (!) different ration regimes? Or are they giving the better rations to their friends and to the prisoners with the best connections and the most clout in the camps? In other words, I wonder how all of these categorizations and differentiations worked in practice. From my research, for example, there were numerous Article 58ers, serving lengthy sentences, who were serving that time in Corrective Labor Colonies, even though Corrective Labor Colonies were supposed to be only for prisoners with sentences of fewer than three years. Article 58ers could also, in practice, be granted unescorted status—the right to move outside of the camps without guard—in violation of regulations that reserved this privilege for prisoners with light sentences. How the Gulag operated on paper was not always how it operated in practice. I would also like to address a couple of issues related more directly to the idea of redemption. Barnes is quite right to highlight the question of release as key to understanding the Gulag. If at least 20% of prisoners were released each year, as he notes, then understanding who was released and why is crucial. 1)	Mass amnesties generally targeted groups of prisoners rather than individuals. Release in this sense was tied not to one’s behavior in the camps, but to the reason one was in the camp in the first place (generally only those with lighter sentences were eligible) in combination with events outside of the camps (the end of World War II, Stalin’s death). So, maybe the regime saw prisoners with light sentences as more redeemable, but these prisoners did not necessarily have to prove it in the camps. Indeed, in my reading of individual prisoner files (and, to be fair, I was unable to look at very many), many prisoners were released at the end of their terms regardless of whether or not their behavior had been exemplary while in the camps. 2)	Periodically, there were also releases of invalids, pregnant women, and nursing mothers. None of these releases, clearly, had to do with good behavior in the camps. Indeed, these releases seemed to have more to do with relieving the camps of an economic burden (and, in the case of invalids, the releases were also a way to improve camp mortality statistics – if these prisoners died as a result of their Gulag experience, they did so after release). 3)	And, finally, if release was tied to redemption, how do we explain the many difficulties that returnees faced after release, from restrictions on where they could live, to employment issues and so on? Have they really been redeemed? Thus, I would be particularly interested in hearing Barnes’ thoughts on these issues concerning prisoner categorizations, the differences between the Gulag on paper and the Gulag in practice, and some of the issues I’ve raised regarding release. Thanks Wilson! On a tangential note, I have a question about the colonies and 58ers that you mention. Do you know that they actually served in an ITK, or do you assume this because they were housed by the provincial UITK/OITK, i.e., not Siblag or another ITL? I ask this because at first I assumed that all prisoners in the UITK/OITKs were in colonies, as the institutional name implies. But I found in the Baltics and in Ukraine that the UITK/OITK’s in the late Stalin era were mostly comprised of LOs, not ITKs. The Estonian OITK, for instance, had 7 LOs and just 2 ITKs in early 1953. So most prisoners in the borderland republics weren’t in the ITLs, but they weren’t in ITKs either. I would be interested if this were also the case in Russia and Kazakhstan (and I suspect that it was). That doesn’t mean that 58ers didn’t ever end up in ITKs, of course….we all know how messy things were on the ground despite (or in part because of) the multitude of classification criteria. In the UITLiK UNKVD for Novosibirsk Oblast (The Administration of Corrective-Labor Camps and Colonies of the Administration of the NKVD for Novosibirsk Oblast, usually written in the documentation with the cumbersome full acronym: UITLiK UNKVD NSO) there are ITK’s (such as ITK no. 6, on the outskirts of Tomsk) that held at least some Article 58ers. I’ve also come across Article 58er invalids who’ve been transferred to ITK’s. I’ll look again, see what other information I can find. Jeff and Wilson, these are both really tremendous contributions to this discussion. I think in many respects the critiques are on the money and in a way are exactly the kinds of response I was hoping for from the “next generation” of Gulag scholars who will take our understanding to the next level. I will have to spend a little time preparing a response and will put it up as a separate post in the next day or two. In any case, redemption here could mean bringing an “enemy” or a “criminal” from the brink of a non-socialist life back into the fold–even if that means the person still is exiled from big cities or required to live in a particular area. Moreover, in this sense being “redeemed” does not necessarily mean that the person is reformed, does it? I’m about to post a long reply in a more substantive sense, but I can’t help but point out how much I loved filling up the books of green stamps when I was a kid! I very much agree with Wilson’s point that there were many classification schemes in the gulag, and that they shifted in importance. Whether you were a petty offender with a five-year sentence or a counterrevolutionary on a 20-year sentence, you faced the same reduced ration if you failed to meet your production targets. The petty offender wasn’t cut any breaks. But I was inspired to comment here because of something Jeff wrote: “… what Barnes describes in the camps often does not reflect his central argument…” This perfectly captures what I often felt as I was reading the book, too. Steve’s text is so rich and includes so many vivid details, that I suppose such an observation is inevitable. To Steve’s credit, the argument doesn’t dominate to the degree that it leaves no room for contradictory data. This is one of the reasons why I think the book is so good.